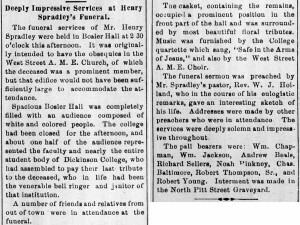 “Deeply Impressive Services at Henry Spradley’s Funeral,” Carlisle (PA) Herald, April 12, 1897, p. 4: 2. 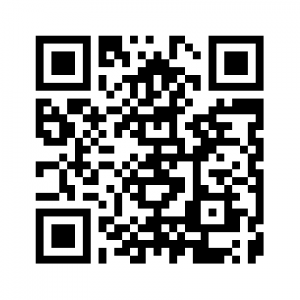 Deeply Impressive Services at Henry Spradley’s Funeral. The funeral services of Mr. Henry Spradley were held in Bosler Hall at 2 30 o’clock this afternoon. It was originally intended to have the obsequies in the West Street A. M. E. Church, of which the deceased was a prominent member, but that edifice would not have been sufficiently large to accommodate the attendance. Spacious Bosler Hall was completely filled with an audience composed of white and colored people. 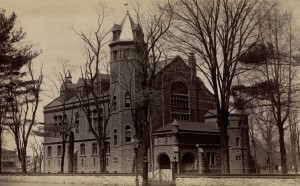 The college had been closed for the afternoon, and about one half of the audience represented the faculty and nearly the entire student body of Dickinson College, who had assembled to pay their last tribute to the deceased, who in life had been the venerable bell ringer and janitor that institution. A number of friends and relatives from out of town were in attendance at the funeral. The casket, containing the remains, occupied a prominent position in the front part of the hall and was surrounded by most beautiful floral tributes. Music was furnished by the College quartette which sang, “Safe in the Arms of Jesus,” and also by the West Street A. M. E. Choir. 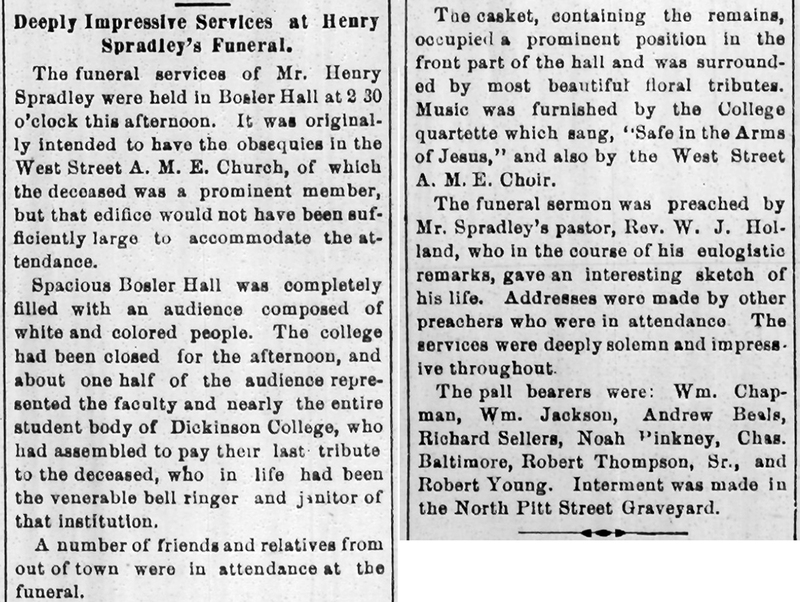 The funeral sermon was preached by Mr. Spradley’s pastor, Rev. W. J. Holland, who in the course of his eulogistic remarks, gave an interesting sketch of his life. Addresses were made by other preachers who were in attendance. The services were deeply solemn and impressive throughout. The pall bearers were: Wm. Chapman, Wm. Jackson, Andrew Beals, Richard Sellers, Noah Pinkney, Chas. Baltimore, Robert Thompson, Sr., and Robert Young. Interment was made in the North Pitt Street Graveyard. 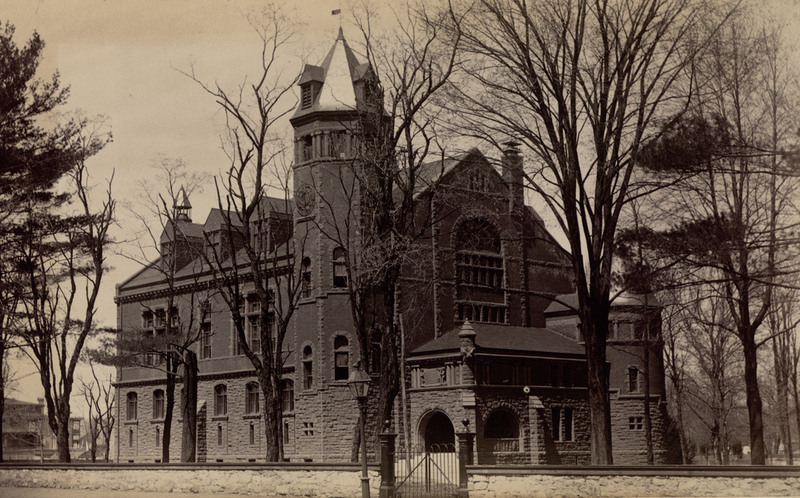 Dickinson College was truly a “house divided” during the Civil War era, its student body was divided nearly evenly between southerners and northerners in the years leading up to the conflict. And once war erupted, many former classmates found themselves arrayed against each other as enemies in the field of battle. Pennsylvania’s Cumberland Valley contained all kinds of families in the Civil War era. Many supported the Union, but not all. A number of families regretted the war and complained about the conduct of both sides. Some of the families themselves were even divided in their loyalties and experienced their own internal civil war. All families in the Cumberland Valley watched the intensifying and deadly conflict with great anxiety and concern. The movement of the Army of Northern Virginia into Pennsylvania in the summer of 1863 created panic in the Cumberland Valley. Here are a collection of newspaper articles from the period that can help students capture the intensity and the uncertainty that surrounded this dramatic “invasion” of the region. Associated with some of the nation’s most important Underground Railroad episodes, the Old Courthouse served as Cumberland County’s primary government building from 1846 to 1962. Reopened under Methodist leadership in 1833, Dickinson College produced some of the era’s leading figures, including a president and Supreme Court chief justice. Residents and soldiers from the Cumberland Valley left a rich collection of letters, documents and artifacts about combat and the home front now available at the Historical Society. 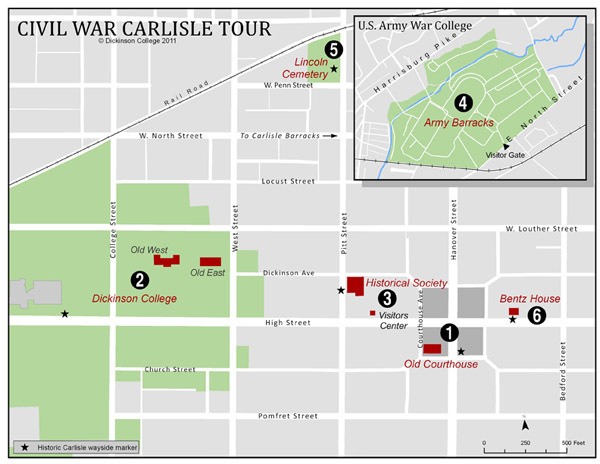 During the 1863 Gettysburg Campaign, Confederate troops occupied parts of the Cumberland Valley and burned down the Army Barracks, which were eventually rebuilt as the Carlisle Indian School. Now known as Memorial Park, the former Lincoln Cemetery contains the remains of many local black Union Army veterans, even though most of the headstones have been removed. 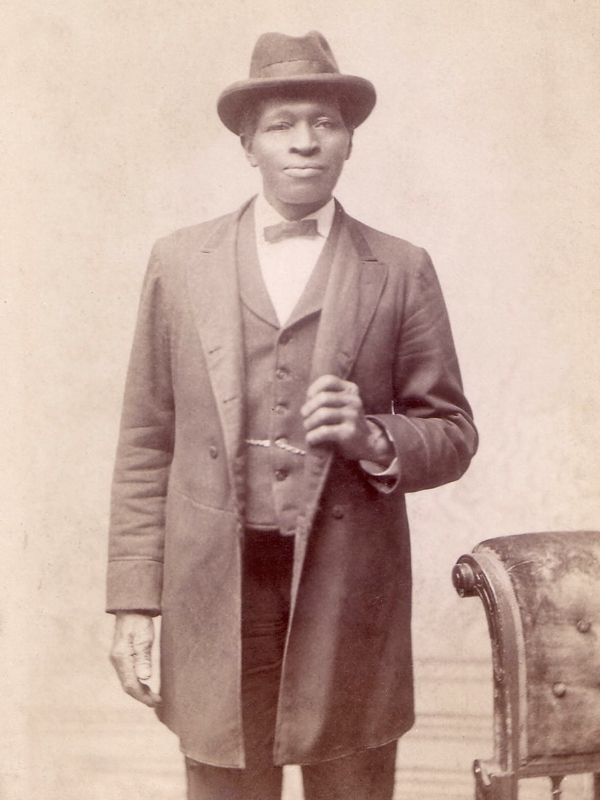 Noted abolitionist Frederick Douglass spoke in Carlisle in 1872 but the local hotel segregated him from white guests in the dining room, offering a sad reminder of the "unfinished work" of the Civil War era. Augmented Reality (AR) is a term for a new technology that allows you to enhance or augment the reality you see through cameras in GPS-enabled smartphones or tablet computers by streaming text, images, audio, and video. 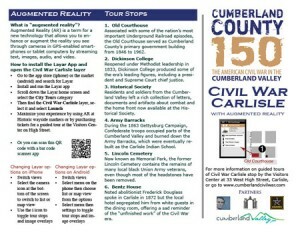 Maximize your experience by using AR at Historic wayside markers or by purchasing tickets for a guided tour at the Visitors Center on High Street.